Every night, my wife and/or I read aloud to our kids, ages six and eight. 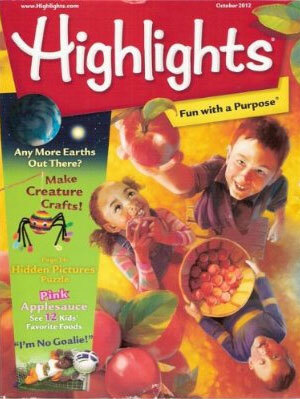 One text we can all agree on to read is Highlights Magazine. Their motto is “Fun with a Purpose”. We recently graduated from High Five, a junior version of Highlights, but the tenets of this publication remain the same. There are narratives, nonfiction, visuals, jokes, questions and answers, original poetry and artwork submitted by other kids and, what they may be best known for, hidden pictures puzzles. There is one hidden picture puzzle titled “What’s Wrong?”. The reader is supposed to find all of the silly things appearing in the illustration. Is this not the most brilliant answer to everything that is wrong with accountability in public education today? I don’t know about you, but I am ready for the editors and writers of Highlights to take the reins of the Department of Education. This ridiculous focus on standardized assessments as the primary focus on student achievement has led to school leaders and teachers teaching to the test and forgoing what they know is best for kids. Like Highlights motto, we can also have fun with a purpose. There is no reason to wait for the political climate to change to make this happen. Teach with intention. Bring in authentic texts. Avoid cookie cutter curriculum that assumes some random publisher or expert is a better teacher than you. Ask open-ended questions and celebrate divergent thinking. Speak up to your school leaders and ask how the current district initiatives are benefiting students now and in the future, both academically and as people. Even though I place blame on the powers that be, I refuse to use it as an excuse for not teaching well. Look closely at the “What’s Wrong?” puzzles, compare what you see to what you know, think creatively – and have fun! What’s silly is up to you. Thanks for sharing this Matt. I’ll have to check and see if the ‘Highlights’ magazine is available in Australia. I think their answer to the question is brilliant, as is your response. I admire the way that you won’t let the faulty expectations of policy impact negatively upon your good teaching. Thank you for speaking up and giving voice to thoughts that many share. Highlights-such a good classic magazine to share with your kiddos! I love their response to the question posed from one of their readers. And, your response is equally as powerful. Brilliant perspective on the Highlights team! I agree with you, too, on your point about having “fun with a purpose” in our classrooms and teaching in ways we know are right for our students, regardless of what’s going on politically. There are so many ways to bring your own classroom to life, to engage and inspire students, to make the ‘work’ of learning fun for students AND us, the teachers. I believe it is possible to do all of this while meeting the demands of our leaders—I’m not saying it’s easy, but it’s definitely possible. It takes a lot of effort, but the most valuable and worthwhile things in life take effort.